The purpose of the consultancy is to provide research and analytical support towards preparation of a scoping review, which will inform and guide the Policy Lab’s engagement in the skills and employment for young people space. In 2015, the world population comprised of approximately 1.2 billion youth between the ages of 15-24, with South Asia and Sub-Saharan Africa constituting almost half of the global youth population. Compared to 2015, the global youth population is projected to increase by another 104 million by 2030 and 154 million by 2050. Although education enrollment among youth is on the rise, UNESCO reports that 36 percent of all adolescents of upper secondary age (ages 15-17) are not in school – the numbers increase to 48 and 58 percent in South Asia and Sub-Saharan Africa, respectively. Indeed, according to ILO’s Global Employment Trends for Youth 2017, around half of the world’s youth ages 15–24 are in the labor force, while some 22 percent (mainly young women) are neither in education, employment or training. However, according to ILO, youth are three times as likely as adults to be unemployed, with 71 million of the global youth labor force ages 15-24 (13 percent) being unemployed in 2017. More significantly, even when youth are employed, job quality is a critical concern. In developing economies where labor market institutions, including social protection, are weak, large numbers of young people continue to face a future of irregular employment and informality. Young workers often receive below-average wages and are engaged in work for which they are either overqualified or underqualified. According to ILO, as high as 19 out of 20 youth in developing countries are in the informal labor market and 37.7 per cent of working youth are living in extreme or moderate poverty (less than $US 3.10 per day). Since an individual’s first job tends to set a precedent for lifelong earnings, those with poor job prospects at the start of their work life risk falling into “low-pay traps.” This is evidenced by looking at transitions among those aged 25–29 - ILO’s school-to-work transition surveys from 34 countries show that less than one-third of workers are able to transit into satisfactory/stable employment by the time they are between ages 25-29.
prospects. Surveys across 27 low and middle- income countries worldwide have found less than half of young employees were considered well-matched in the labor market. For young people the employment challenge is also complicated by a range of intermediation or market failures - such as information gaps, credit market failures, etc. - that prevent eager young job-seekers from successfully connecting to employment opportunities (wage or self-employment). It is important to note that, across countries, youth transitions into the labor market are affected not only by their education or skills level, but also depend on the number and kind of jobs available in the market, which themselves are shaped by external factors like economic growth, infrastructure, and investment climate. The Policy Section in the Division of Data, Research and Policy (DRP) serves as a catalyst to connect and amplify the data and research functions within the division and to analyze new and emerging issues, scope policy options and develop recommendations. With the Policy Section, the Policy Lab Unit was established to develop policy recommendations on new, complex or cross-cutting issues affecting children in order to inform UNICEF’s engagement and positioning, review the viability of policy solutions and provide policy guidance to UNICEF’s Country Offices and National Committees on how to integrate issues of growing importance into concrete actions. The issue of skills and employment for youth is an emerging area of interest in UNICEF and the Policy Lab is seeking a consultant to support a scoping review to help inform and identify potential opportunities of engagement in this area for the Policy Lab. Result 1: Updating the theory of change framework for improving employability of young people ages 15-19 in productive jobs. Identify and gather relevant frameworks on skills for work and other literature (systematic reviews, evidence notes, etc.) to update the intervention matrix for the following outcome areas: (a) increasing supply of young people equipped with the skills demanded in productive jobs, (b) increasing access of young people to productive jobs. In the review, pay special attention to identifying interventions fostering inclusion of under-served and vulnerable groups, including young people in humanitarian contexts. Collate comments and feedback from the working group, relevant experts and reviewers on the theory of change framework (including the intervention matrix), and update accordingly. Result 2: Synthesizing trends and challenges in skills acquisition and employment for young people ages 15-24, with particular attention to trends and challenges for young people ages 15-19. Where possible, disaggregate the analysis by region, gender, socio-economic status, rural/urban. Where secondary sources are not adequate or available (e.g. dis-aggregated data for the 15-19 age group), limited analysis of survey data may be undertaken to fill in gaps. Based on the data synthesis above and review of relevant literature, identify key challenges to improving skills acquisition and employment opportunities and outcomes for young people, in particular young people ages 15-19. Contribute to development of taxonomy of countries based on skills acquisition and labor market context and challenges, based on data synthesis and literature review. Result 3: Mapping of UNICEF programs on skills and employment for young people ages 15 and over. Identify and gather reports and instruments from previous reviews/mapping done by UNICEF of similar scope. Based on the review, identify information gaps and develop mapping tools and related coding schema to fill in the gaps. Identify and gather relevant policies, strategies, project, reporting and evaluation documents. Extract relevant data from the documents above and populate the mapping and review tools, following the coding schema developed earlier. For a sample of 10% program countries (to be decided), map and identify if there are large-scale programs or policy support by other key agencies (e.g. WB, regional MDBs, bilaterals, ILO, UNESCO, UNDP, EU) on skills and employment for young people based on the intervention matrix, and scope of coverage (i.e. scope, scale, equity focus). Contribute to 2-3 in-depth case studies of existing UNICEF programs, through desk review, questionnaire development and key informant interviews. Analyze trends and patterns in UNICEF engagement in the skills and employment space based on extracted data and already available reviews. The analysis will specially focus on patterns and trends related to (a) relevance – e.g. 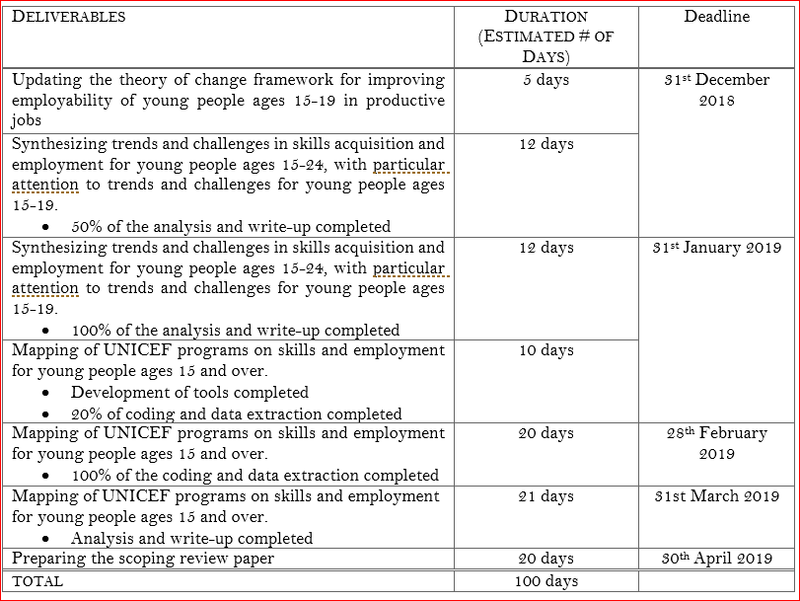 how UNICEF engagement maps vis-a-vis the intervention matrix, synergies with other development partner programs in country, relevance to skills acquisition and labor market issues for young people faced by country; (b) efficiency – e.g. unit cost in PPP, ROI, etc. ; (c) equity – e.g. focus on excluded and vulnerable groups; (d) effectiveness – i.e. project outcomes related to improved skills acquisition, school to work transition, and/or employment; (e) sustainability. Result 4: Preparing the scoping review paper. Contribute to identifying gaps and opportunities for UNICEF engagement (and DRP in particular) in the skills and employment field for young people ages 15-19 through supporting further consultations and key informant interviews – e.g. preparing questionnaires, organizing and participating in meetings, summarizing and analyzing responses and feedback. Write specific sections of the scoping review paper as agreed and determined with the DRP team, and produce graphs/charts for the paper. Home-based with occasional travel to NYHQ for face to face meetings and discussions. At least 2 years of research experience as a research assistant/research analyst in a social sector field with an international development organization, research organization, think tank or university, undertaking tasks similar to ones outlined in the TORs above (i.e. literature review and synthesis, data extraction and coding, quantitative and qualitative data analysis). Research experience in education, skills and labor market areas for developing countries highly preferred. Experience in doing intermediate to advanced data analysis using Excel is required. Experience with using STATA for data analysis highly preferred. Fluency in English is required. Fluency in another UN language is preferred. Excellent communications skills (written and oral). Self-starter with demonstrated ability to work independently, manage deadlines and multi-task. Proficient knowledge of Microsoft Word and Power Point. Willingness to learn new tools and techniques.